Matt beat me too it, but I too felt it was about time to do one of these again. A while ago, the circle of healing was started as a way of members of the community to share information about themselves will everyone else in the blog-o-sphere. It has been so long, in fact, that many updates and an expansion have come along since I last filled this out! So, I guess it’s time for an update, as many things have in fact changed for me. For example, I’m no longer on Zul’jin, instead now I’m on Ner’Zhul. If I had to pick one it would have to be Spirit Link Totem. If you’ve been reading me for any length of time, you’ll know that I’ve had a love affair with this spell since it was first conceptualized in the beta for Wrath of the Lich King. I’ve fawned over it, lamented it’s removal from the game, and celebrated (actually through a party IRL) the re-integration of this amazing spell back into our arsenal in Cataclsym. I’ve been finding new ways to use it and ways to combine it with other spells like Rallying Cry and Power Word: Barrier in various encounters for new and awesome results. I think though, that it really is my favorite not because of it’s versatility, but because I have been crusading for the spell to be brought back since it was removed. Funnily enough, putting it from a spell we cast into a totem to add a limitation to it was one of the very first things I ever fired off towards Blizzard years ago. I love me some totems. If you asked me in the last tier of content I would have said Greater Healing Wave. Now though, I honestly don’t know. Every spell we have has a place in each encounter. It’s not like we have a huge toolkit (though it has been expanded over the years). If I had to just pick a spell that is classified under healing but I never use, it would probably be Totem of Tranquil Mind. It’s a water totem, water is the shaman element of healing, therefore I classify it as a healing spell. I just never use the damn thing. Compared to Mana Spring Totem or Healing Stream Totem, it’s just always outclassed. Honestly, give me back my damn Sentry Totem! At least I used that. Versatility. Shaman are capable of going from single target healing to group healing without really having to worry about switching gear or stats. While some stats are preferable for each role, we are capable of swapping on the fly and that lends us a certain strength. Combine that with a new defensive cooldown that cuts through healing reducing effects and well, we’re just one awesome healing class. Unlike other classes our mastery is good/bad in a cycle. Beginning of a tier, or at the start of hardmodes, shaman mastery is a champ. After that however, it sort of becomes the redheaded stepchild in lieu of throughput stats like haste and crit. Other classes benefit from their masteries pretty much all the time, where ours only really gets the lime light if someone messes up and takes a ton of damage, or the raid as a whole is failing. It actually gets worse as players skill and gear improve. What’s up with that? Raid healing. I’m a roll healer by desire, I love placing Healing Rains, rolling Riptide and Chain Heal and keeping up as many people as I can through some ridiculous damage. I do well at it and I enjoy it. I also think I excel at special assignment healing, such as healing the kiting team for heroic Magmaw, that was just a blast. Which healing class do you enjoy healing with most and why? Toss up between Druid and Priest. There’s a lot of synergy there between the way druids and shaman heal together, as well as both flavors of priest. Hymns, barrier, Tranquility and crazy HoTs, they all seem to compliment shaman healing quite well. Paladins, for the pure petty reason that they stole my Healing Stream mechanic! no honestly its just because of the difference in healing styles. I have a hard time working around paladins most of the time because they just feel like a brute force healing class where as the others feel more delicate or graceful. No offense to any paladins out there, I know they are exciting to play, I just can’t get the image of a paladin busting his holy book over someone’s head while screaming “BE HEALED BY THE LIGHT” out of my mind. Matt said it, and I’m going to echo it. Getting blamed for healing problems when it’s not a healing problem. There seems to be this mindset, recently even more so than before, that any problem can be solved by obtaining better healers. Sure, sometimes the healers are messing up or need to tighten up, but rarely is it actually a bad healer. Too often are healers judged purely on meters and raw numbers. Sure World of Logs analysis plays a part in evaluating a healers performance, but unlike DPS being the top of the charts in healing isn’t always a good thing. There are always different factors to consider such as the fight, healing assignment , class of the healer as well as the healing team in the raid. Everyone is quick to blame healers, when DPS standing in the wrong spot can cause a wipe just as much as low healing. I’ve been healing a long time. 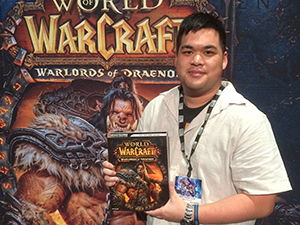 I’ve been writing here, my own blog and at WoW Insider now for quite sometime. I got to these places as a healer trying to explain healing to other healers. That’s tough enough some days, but try explaining it to non healers sometime. That’s a brick wall that’s hard to crack most of the time. Yes. Shaman were used as the “model for healing” this expansion, so we’ve always been a viable class / spec. Even when our numbers weren’t perfect we were still doing well. Now with recent adjustments we’re right about where we need to be and I think we are pretty well balanced. To evaluate my own performance I’ll go through World of Logs and check to make sure my spell usage is consistent with the encounter and my assignment in the encounter. If it is not, then that’s usually my cue to change what I’m doing. Honestly, I’m kind of tired of hearing the phrase “shaman can’t heal this”. I have yet to fail in any healing assignment. Just because I don’t top the meter doesn’t mean I can’t heal something. All the classes are capable of all the healing roles. True some may be better than others, but nothing quite gets under my skin like the statement that I CAN’T heal something because I’m a shaman. Getting rid of healer tunnel vision. New healers are rarely aware of their own health totals, and you can usually tell how long a healer has been healing by how quickly they react to incoming damage. Whether it’s healing themselves or blowing a cooldown to survive it tends to be a tell-tale sign. That habit is hard to kick, and it’s because of that I love any addon that lets you put your own health in an easily visible place, or ones like GTFO which audibly alerts you to incoming damage or spell effects. If someone were to try to evaluate your performance as a healer via recount, what sort of patterns would they see? That I tend to pace my healing for long fights. I’m a long sight healer. I try to make sure I’m using the most cost effective heal for the job. So my throughput might not be as high as some of the other healers in the group, but I make sure I have mana to continuously heal through a fight, unlike a certain dwarf priest. Also that I cast Lightning Bolt quite a bit! The new 4.2 crit giving 200% healing is nice, but I’ll still pick haste first every time. Haste is just so good when it comes to pumping out the healing, and getting to each haste plateau does nothing but improve my healing and help increase the effectiveness I bring to a raid. That’s right folks, I’m a haste junkie! What addons or macros do you use to aid you in healing? Aside from a focus macro for Earth Shield and ones to keep me from casting Heroism or Mana Tide when not in combat, the only really healer centric thing I use for myself is Grid. I have it completely configured to show me exactly what I need to know for every member of the raid. Do you strive primarily for balance between your healing stats or do you stack some much higher than others and why? I try to hit the haste caps (916 and now 2005) and then after that I maintain balance between my primary healing stats. Haste just gives me so much more throughput on pretty much everything that I can’t ignore it. I then adjust the rest of my stats according to the tier of content or fight, but generally try to maintain a balance. That’s it for me on this circle of healing patch 4.2 edition. Normally I would tag individuals, but instead I’m going to tag the entire restoration shaman community as well as anyone who follows me on twitter, or on google +. This also goes for any of the readers out there with blogs of their own! Consider yourselves tapped for this Circle of healing, and I completely expect posts from you guys! It’s always the Priests that can’t control themselves and blow through mana like junkies, isn’t it? You guys make me wanna pick up my WoW sub again. Maybe when the employment thing is back up and running. Please *do* join in all you bloggers out there, but let me know and I’ll add your responses to my list of everyone who has participated this time around!